Crashing into heavily padded ice hockey players may not be the most common way to relax, but for a bunch of hardy expats in Beijing, smashing it up on the ice is a welcome slice of home. What started as an annual Russia-Canada diplomatic friendship ice hockey game on the lake inside the Russian embassy 20 years ago has snowballed into a fully-fledged league. 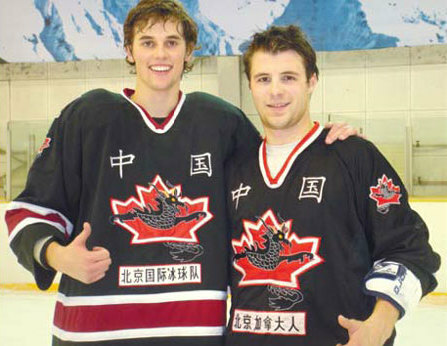 Canadian Ray Plummer, a construction project manager in Beijing, turned down a hockey scholarship as a teenager, and now runs the Beijing International Ice Hockey Organization (BIIHO). He says that in order to enjoy their time abroad, expats must find things they enjoy. And for him and about 100 other foreigners working and learning in the capital, risking life and limb to chase the puck around the ice rink is exactly what sustains them. "When in a foreign country, you want an escape from the chaos - the stress of work," Plummer says. "For many of us, hockey is the weekly escape to be with like-minded players. "We are a non-profit group, it's all volunteers, and we charge just what it takes to rent the rink and pay for beer, water and the referee." Canadian Simon Bullard moved to Beijing five months ago to explore another country and pick up the local language and plays right forward for the Beijing Dragons, one of five BIIHO teams. His father taught him to skate at the age of 5 with stick in hand, par for the course for most Canadian youngsters. The speed and competitiveness of the game is what gets the 20-year-old's blood pumping. Ice hockey is played in three periods of 20 minutes with interchanging every minute. Five players plus a goalie take to the ice for each team. In competitive hockey, the rule of thumb is to go as hard as you can for that one-minute shift, come off and rest, then go back to the fray. Despite the appearance of anarchy there are many rules and a player is fouled for tripping, elbowing, roughing, high-sticking, delaying the game, holding, using illegal equipment, charging (leaping into an opponent or body-checking him after taking more than two strides), holding, interference, hooking, and cross-checking. An offending player has to sit it out for two minutes before returning to the game. Many expat players in the league are in Beijing studying Chinese at university. One of them, Danish student Benjamin Sherman, 23, says playing his beloved sport is a way to untangle the mind from the complications of a very difficult foreign language. "Playing ice hockey is my release from staring at hanzi all day," he says. "For those two hours, it's just hockey." Everyone is welcome to play, including women, although organizers want people who can play at the same level. Players range from semi pros and college-level competitors to beginners, who only took up the sport in China two years ago. One of the league's most talented players is Roman Lebedev, who came to Beijing as a 16-year-old from Russia, where he played on the Moscow Spartek Jr. team. His father works for the Russian embassy and he has spent his teen and early adult years in Beijing. For the past seven years, the ice hockey league has been his passion and he has been one of the leading scorers. While there is a Chinese team that is part of the Asian Ice Hockey League, it's based in Shanghai. "The Chinese league hasn't developed too much but there is room for growth," Sherman says. He says the large numbers of young people mean great potential for the sport. "I mean there are 1.3 billion people in China you got to figure there is a couple of thousand who want to play ice hockey," he says. The club also hosts international teams out of Beijing for exhibition matches as well and traveling domestically and internationally. In October last year, the club went to the Democratic People's Republic of Korea (DPRK) to play against a national development team. The first game was a 11-9 win and the final game was 6-4 victory for the DPRK. In Asia, the players meet the same people at all of the tours and have created great personal and business relationships across the region. "It is a fantastic fraternity laced beyond boundaries and borders and is the coolest way to travel," says Plummer. There are 100 players in the league and competitors from Russia, France, Sweden, Finland, China and the US make up 41 of the players. The Canadians are the biggest group making up the other 59. "We are from many different countries, speak different languages, are involved in different industries, but we are all friends on or off the ice after the game with a beer in hand," says Plummer. "What's not to love about that?" Beijing International Hockey trains every Thursday and plays every Sunday at the Beijing Century Star Arena.